Police acted lawfully when they detained more than 1,000 people for more than seven hours during a May Day protest, the Court of Appeal has ruled. 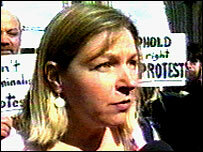 Geoffrey Saxby, from East Sussex, and protester Lois Austin, of Southwark, south London, claimed the tactics in 2001 breached the Human Rights Act. They were among people corralled in London's Oxford Circus without food, drink or access to toilets. The appeal court backed the High Court which rejected the claim in March 2005. Mr Saxby, from Hastings, said he was not involved in the protest but had got caught up in the chaos while collecting money from a bank. Ms Austin told the court she had to get a friend to collect her 11-month-old daughter from a creche because she was not allowed to leave to pick up her up. The Metropolitan Police had argued the containment was lawful in order to maintain peace and was necessary to protect public safety and prevent disorder and crime. The pair, who sought damages alleging false imprisonment and a breach of their right to liberty under the European Convention, were given permission to appeal against the High Court decision. Agreeing with the High Court judge's earlier ruling, Master of the Rolls Sir Anthony Clarke said the pair's "imprisonment" was lawful. He said: "The risks were from crushing, trampling and missile-throwing which could have been fatal. "The crowd of over 1,000 at Oxford Circus needed measures to be taken to control them for their own protection." "It was a dynamic, chaotic and confusing situation in which there were also a large number of other protesters in the immediate vicinity outside the cordon who were threatening serious disorder and posing a threat to the officers both on the cordon and within it."